1.1 Warning: Out of date!!! Please note that this guide is very old and doesn't contain the latest instructions for configuration CTDB and Samba. For the parts covering CTDB and Samba specific configuration please follow the various sections under CTDB and Clustered Samba. This guide is written to assist a relatively inexperienced users through the setup of a fairly complex system in a step by step fashion. However, for the sake brevity I'm going to assume you are reasonably comfortable with GNU\Linux, can use Vim, Emacs or Nano. Have a grasp of basic networking etc.. and are not afraid of compiling some code :) . Elements of this setup are somewhat interchangeable. You could probably replace CENTOS with another distro but would subsequently need to be familiar enough with that distro to be able to modify the appropriate commands and paths. Others may wish to replace GPFS with alternate clustered file system or use a variation of my Samba configuration below. This setup has been tested in a non production environment. Deploying as such in a production environment is at your own risk and the author as such assumes no responsibility . This is a simple test setup. I’m going to use a couple of KVM VM’s but the same principles should apply on bare metal . This approach should scale to many physical/virtual servers . The diagram below illustrates our setup. First we want to install a couple of servers. I have chosen CENTOS 6 as it is binary compatible with RHEL 6 which is well supported by both GPFS and Samba. Create a couple of CENTOS 6 VM’s (I use virt-manager on CENTOS 6 but you can use any tools you like) . I use an ISO image CentOS-6.4-x86_64-minimal.iso. The VM will have 1 CPU and 1G RAM and an 8Gig disk . Initially I allocate 1 NIC but we will add a further NIC for a private LAN later. Don’t forget to set a valid DNS server in /etc/resolv.conf also. Once you're sure you have a working network connection, install the latest updates with the yum update command. In virt-manager create a couple of 1GB IDE disks for our GPFS Cluster. When you try to add the disk to the 2nd server (sambagpfs2) virt-manager will give you a warning that “the disk is already in use by another guest” but this is OK. We are building a clustered file system where shared access to the underlying disks is necessary. Make sure you can see both disks from both servers (sambagpfs1 and sambagpfs2). There appears to be a communication problem between the GPFS Daemons when SELINUX is enabled. Edit the /etc/selinux/config file and set SELINUX=disabled. Also stop the iptables server and disable it on restart. It goes without saying that you need to consider these steps more carefully in a production environment. Generate the ssh key with the ssh-keygen -t rsa command on sambagpfs1 and copy to the other server using the command ssh-copy-id -i /root/.ssh/id_rsa.pub 192.168.1.12 . Also in the ~/.ssh folder run cat id_rsa.pub >> authorized_keys . This is necessary as our GPFS setup uses the ssh shell to execute commands locally as well as remotely. Otherwise we will be prompted for a login on the local machine when executing GPFS commands . Now, perform the inverse of the above on the second server gpfstest2. You should now be able to zip between the two servers with the ssh <IP address> command. If not use the -v switch in the ssh command to debug. Add your hostnames and internal IP addresses to the /etc/hosts file . My settings displayed below for reference. Check the time is synchronised using the date command. Now we are just about ready to begin installing GPFS :) . This will build an rpm for the portability layer . The benefit of building this rpm is that we will not need as many prerequisites in our other cluster members. In general it is bad practice to build as root. See http://serverfault.com/questions/10027/why-is-it-bad-to-build-rpms-as-root . As this is a non production test system i’m going to give myself a pass (for the moment). 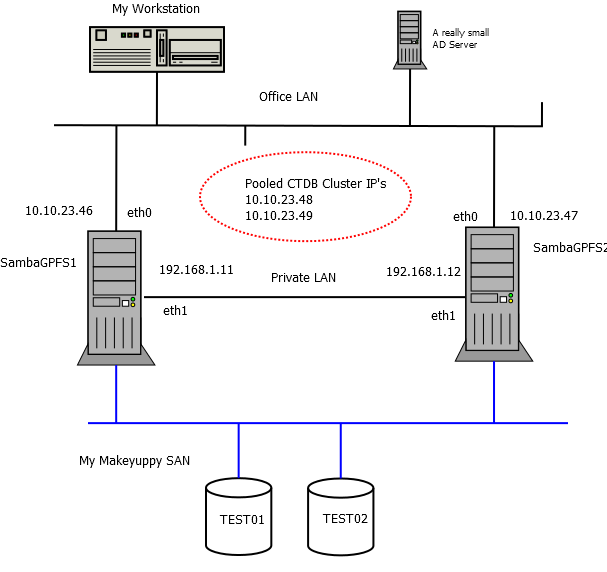 Finally, copy the portability rpm to the other cluster servers, in this case sambagpfs2 . Create the test cluster using the mmcrcluster command. This sets sambagpfs1 as the primary server and sambagpfs2 as the secondary server. -A specifies that the GPFS daemons start on boot. Use the mmlscluster command to verify that the cluster has been created correctly. Now create our NSD’s for our two shared disks /dev/sda and /dev/sdb. Use the mmlsnsd command to verify creation. We only have 2 nods in our GPFS Cluster so we need to set a tie breaker disk . Shut down GPFS to add the tie breaker disk. To ensure recent versions of Microsoft Excel work correctly over SMB2 we also need to set the following configuration in GPFS (Many thanks to Dan Cohen at IBM - XIV for this tip). At this point you should see the GPFS file system mounted at /sambagpfs on both of our servers. Congratulations !. Take a break, stand up and walk around for a bit. Now run make install on the sambagpfs2 also. This is a configuration for a AD domain member server. I did not have the necessary privileges on our AD to install RFC2307/SFU schema extensions . If you have such access then this would be a better way to proceed as you would have consistent UID/GID allocation between clusters. Now start the CTDB daemon on both servers. At this stage the nodes will report as unhealthy as winbind will not start as we have not joined the domain. So lets join the domain. All going well you have successfully joined the domain if not the debug information will assist you in finding the issue. winbind will not have started successfully when we first started CTDB so we can start it manually now. In addition the following command should return valid user information. The wbinfo -u command should list the users on your domain . Our domain has 10’s of thousands of users so this may take some time. You may even have to to run run wbinfo a couple of times to get valid results. The ctdb ip command should report the current assignment of our cluster ip’s . Now try to access the shares from windows. For some reason that I could not fathom I was getting an access denied when I tried to access that shares at this point. I rebooted both servers and this appeared to resolve the issue :). The only really tested GPFS ACLs style is -k nfsv4. You need to create a DNS alias that redirects requests to your samba cluster in a round robin fashion. So in our setup we need to create an alias the resolves to both 10.10.23.48 and 10.10.23.49 . So there you have it. I hope this guide has been useful. Any constructive feedback is welcome to improve the guide, particularly from anybody who is running such a system in a production enviornment. For a complete open source solution you could replace GPFS for GlusterFS (which appears to be maturing nicely) or possibly OCFS2. Perhaps i will have time to test this some day but thats another days work. This page was last modified on 17 September 2018, at 06:25. This page has been accessed 27,412 times.